Feulner reminded the audience that the first donor to the Hoover Institution was a private citizen—a man simply seeking to better the world through an understanding of the enormous power of ideas. That donor was Herbert Hoover. Amid the wreckage of World War I, Herbert Hoover helped save the lives of millions of civilians and saved troves of vital historical materials documenting, among other things, the tragedy of how the world war had unfolded. “Evil prevailing where it needn’t have.” That sobering truth, said Feulner, frames the urgent mission of the Hoover Institution and the critical role of its donors. Feulner’s address set the table for overseers to consider the Hoover Institution’s serious role in the world today. In its centennial year, the Hoover Institution is as vitally needed as it was at its founding. Ideas still have consequences. Hoover fellows that spoke during the next two days illustrated that point. Kiron Skinner, a Hoover fellow currently on leave to direct the State Department’s policy planning office—which she described as a “think tank” within the State Department—described how the “big ideas” gleaned from sources like Hoover are being applied to the decisions made today in dealing with “war, revolution, and peace.” China, North Korea, Russia, Iran, Venezuela, the United States’ southern border, and other conflict areas all present daily challenges that Hoover scholars are helping America to confront. H. R. McMaster—the Fouad and Michelle Ajami Senior Fellow at Hoover who served as national security adviser in the Trump administration following a decorated career in the US Army—outlined the military consequences of a Chinese government that has “re-radicalized” after a period of liberalization. He emphasized the abrupt challenge to America resulting from China’s unfortunate regression to authoritarian rule and its ambition to challenge the United States and the values of a free society. He also gave overseers an inside look at the administration’s responses and options for the future. Niall Ferguson, the Milbank Family Senior Fellow at Hoover and a leading historian, took attendees to the front lines of the trade, cybersecurity, and information technology conflicts in which the United States and China are already embattled. The future could ride on decisions that will be made in the next two years, and Hoover is charting a course to confront China’s threats. The same struggle of ideas is being fought on the home front. Speakers reminded the audience that ideas do have consequences, and that good ideas need champions—underscoring the crucial importance of Hoover donors and scholars who publicly make the case for freedom. 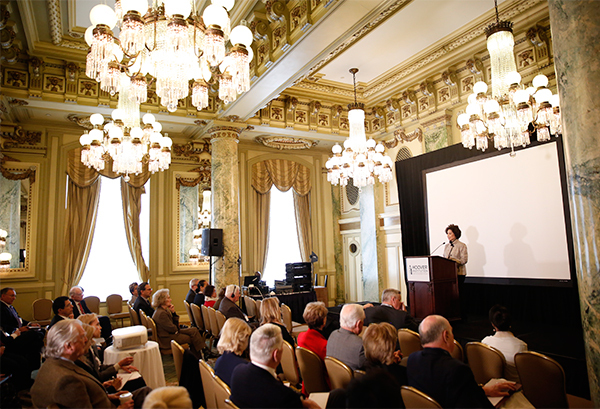 Guest speakers who helped reinforce these points included Elaine Chao, US Secretary of Transportation, who spoke to the group about the threat of over-regulation but also the promise of innovation in a free society. She outlined areas where technology is on the verge of revolutionizing American life in positive ways. Heather Mac Donald, noted author and fellow at the Manhattan Institute, gave a bracing analysis of what she calls “the diversity delusion”—the enormous movement in universities and other institutions to undercut merit-based advancement, free markets, individual worth, the pursuit of knowledge, and other central pillars of our free society. Kevin Hassett, chairman of the White House Council of Economic Advisers, recounted the aggressive opposition the Trump administration encountered while implementing—with key input from Hoover economists—tax cuts and deregulation. Despite ridicule and skepticism, the market-based reforms worked. He called Hoover “about the most important organization” due to its ideas and innovation. Returning to the topic of education, Research Fellow David Davenport presented an analysis of where civic education has gone wrong in America’s schools, as well as new ways to reach students, parents, and teachers. And Edward Lazear, the Morris Arnold and Nona Jean Cox Senior Fellow at Hoover, gave his 2019 economic forecast, noting crucial variables to watch throughout the year. The Hoover Institution was born amidst a global storm, conceived in and dedicated to ideas defining a free society. It has succeeded for one hundred years because of a consistent and principled drive for excellence. It has grown as donors supported its work as an expression of their own desires to impact humanity. And Hoover now moves into its second century as a proven champion of freedom in a world no less challenging than the one in which it was born. Eric Wakin, deputy director of the Hoover Institution and the Robert H. Malott Director of Hoover’s Library & Archives, moderated a panel with representatives from the DOJ, DHS, and FBI, who explained how Hoover’s archival resources have aided their work investigating human rights violations and war crimes. Three students from Hoover’s 2018 Summer Policy Boot Camp received the program’s Director’s Award at a ceremony following the opening dinner. Hoover director Tom Gilligan led a briefing on recent institutional accomplishments, which included a paneldiscussion with alumnifrom Hoover’s National Security Affairs Fellowship Program, media program, Summer Policy Boot Camp, and Stuart Family Congressional Fellowship Program. Also participating in the briefing was Kiron Skinner, the W. Glenn Campbell Research Fellow at Hoover, who is currently on leave from the institution to serve at the US Department of State as senior policy adviser to the secretary of state and director of policy planning.